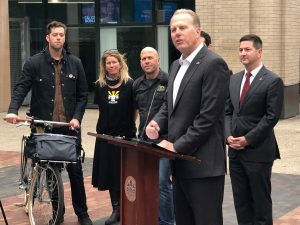 The Downtown Mobility Plan (DMP) has broken ground in San Diego as of December 19, 2018! Paint crews began striping thermoplastic lanes along J Street and the entire DMP Phase 1 should be complete “in a few months time,” according to Mayor Faulconer. This day has been a long time coming after years of planning, delays and cost overruns, but we’d like to offer our thanks to Mayor Faulconer for pushing this project forward over the last couple of months. We note that in 2016 the mayor pledged to complete all cycletracks during his 2nd term. These tracks are two-way cycle tracks (special bike lanes that provide a right-of-way for cyclists and scooter riders within the roadway). Parked cars, flex posts, and or grade variations will separate the tracks from vehicular traffic. 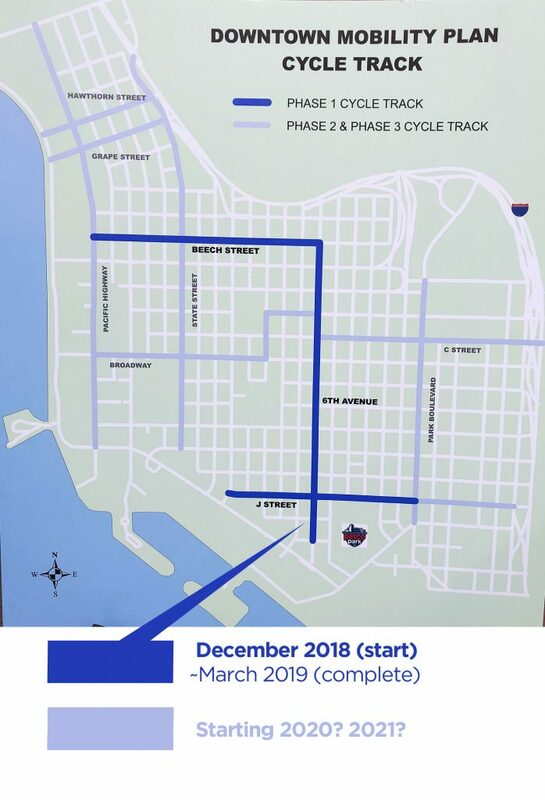 When all three phases are fully built-out, the Downtown Mobility Plan will provide 9.3 miles of these two-way cycle tracks around downtown San Diego, connecting points like the Convention Center with Balboa Park. More on this from the San Diego Union-Tribune story. We applaud the mayor for getting this often-delayed project out of the City’s Streets Division and onto city streets. While Phase 1 is a great start, Phases 2 and 3 represent the greater share of the Downtown Mobility Plan bikeways and will likely not unfold as quickly or easily as Phase 1. Natalia Torres, Associate Civil Engineer for the City’s Streets Division, explained that the later Downtown phases may not be managed by the City’s Streets Division but instead may be handled by the Department of Public Works (DPW). For those not familiar with the city’s bifurcated engineering divisions, this could be bad news for cyclists and scooter users because DPW is often slower to roll out infrastructure. DPW staff typically handle physical infrastructure like drains, underground wiring, and things like Americans with Disability Compliance elements. DPW often takes longer because they deal less often with things like bikeway design and surface configuration. And given that later phases of the Plan involved difficult pedestrian and bike connections to the notoriously bad Pacific Coast Highway, this challenge will be significant for DPW staff to handle. RideSD, BikeSD and other mobility advocates will need to continue to press the city to move forward on the DMP, especially to push the city to use the Streets Division to implement Phase 2 and 3 of the plan so that it doesn’t get slowed down. And we expect continued opposition from groups like the Little Italy Association, which has a history of opposing bike lanes in their district. Even though today was a day to celebrate a small victory for biking, scooting, and walking safety, there’s a long road ahead to complete the full vision of the Downtown Mobility Plan. The news media will move on from this story. Elected officials may change or depart. Engineering staff may move on to other projects. But RideSD will be there, making sure that the Downtown Mobility Plan continues to get attention and move towards full completion.